Jobmonster is an advanced Job Board WordPress theme with a modern, clean, intuitive, and fully responsive design, that looks perfect on any size tablet or mobile screen. It is the result of years of development in Job Portal industry. The theme completely covers the needs of employers and candidates. The author brings to the table new features like Clean coding, Exclusive job functions, Easy installation and customization, Front-end Job Submission and Edition for Admin Review, Job Posting Pricing Plan with WooCommerce Integrated and much more. Employers can submit and edit jobs directly in the front end following submission steps. Then the admin can review to approve or reject a job. Candidates can post a number of resumes directly in the front end following submission steps and choose which one is searchable. You can set the number of jobs posting plan. Payment can be completed effectively with WooCommerce integrated. Employer Management Dashboard Employer can edit Company profile, manage jobs, view, and response to applications from candidates. Employers can edit Company profiles, manage jobs, view, and respond to applications from candidates. Candidates can edit profiles, manage resumes, view jobs applied, bookmarked jobs and manage job alerts. 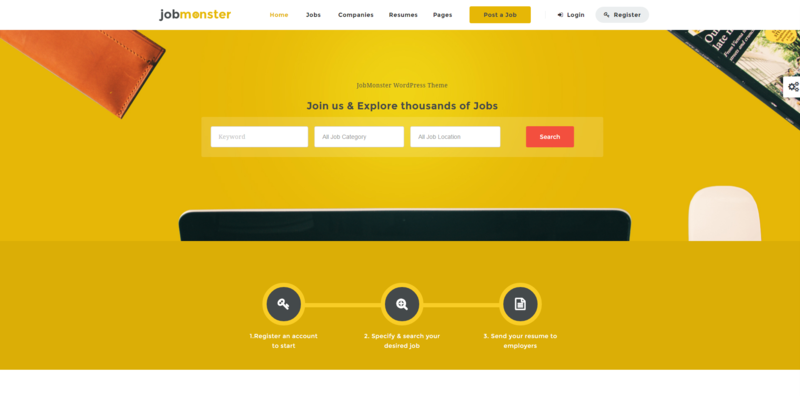 Jobmonster allows you to enable admin to review then approve or reject job submissions from the Admin panel. View Company listing alphabetically and Company profile with their available jobs. Jobmonster Customizer is versatile, so you can configure and change the settings of almost every element on your site. You also can import and export your settings to use them for your next project.